This is a set of covalent atomic radii (Ref. 1) deduced from crystallographic data for most of the elements with atomic numbers up to 96. These data show a well behaved periodic dependence that allowed interpolation for a few elements for which structural data is lacking, notably the noble gases. These values remove some inconsistencies in earlier covalent radii values. Additional graphs for these data will appear shortly. 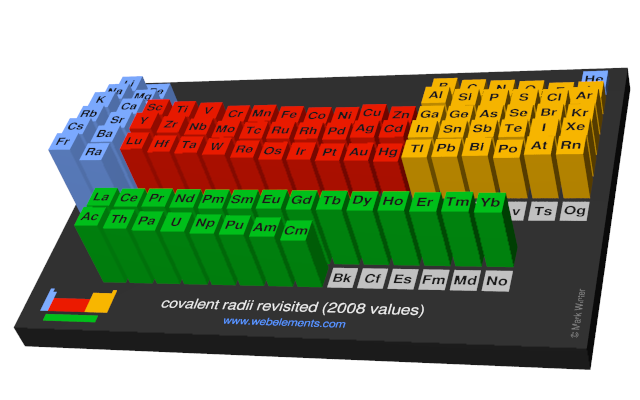 Image showing periodicity of the chemical elements for covalent radii revisited (2008 values) in a periodic table cityscape style. 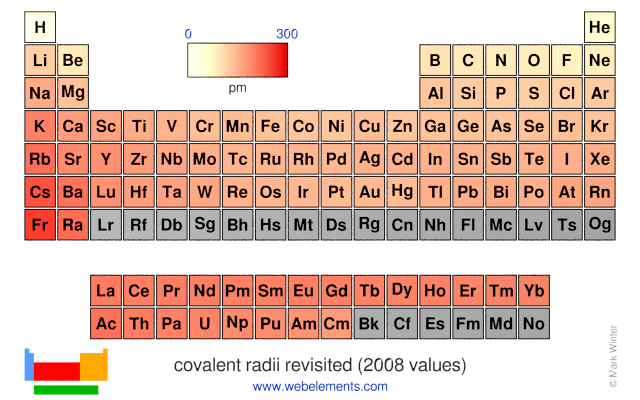 Image showing periodicity of the chemical elements for covalent radii revisited (2008 values) in a periodic table heatscape style. 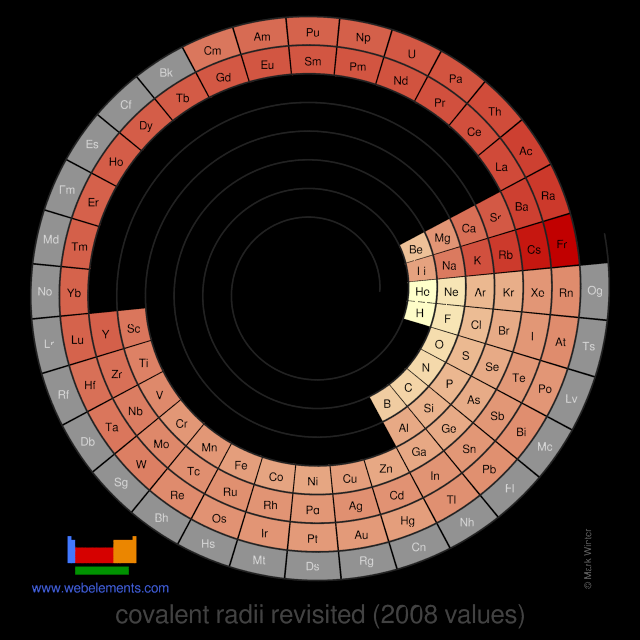 Image showing periodicity of the chemical elements for covalent radii revisited (2008 values) in a spiral periodic table heatscape style. 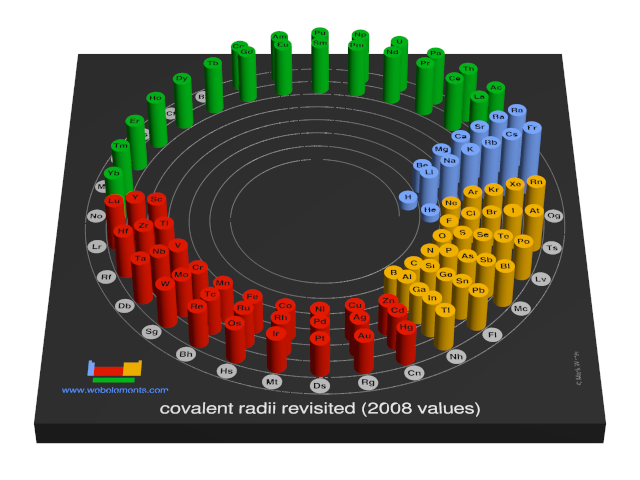 Image showing periodicity of the chemical elements for covalent radii revisited (2008 values) in a 3D spiral periodic table column style. Image showing periodicity of the chemical elements for covalent radii revisited (2008 values) in a 3D periodic table column style. Beatriz Cordero, Verónica Gómez, Ana E. Platero-Prats, Marc Revés, Jorge Echeverría, Eduard Cremades, Flavia Barragán and Santiago Alvarez, in "Covalent radii revisited", Dalton Trans., 2008, [DOI: 10.1039/b801115j].